It's true I can't speak much Spanish past "Uno Cerveza Por Favor," however, there is one Spanish word I have been dropping a lot lately - "Dia de los Muertos," or "Day of the Dead. It's a rememberance of those who have passed on, a festivity mostly in Mexico and in other Latin American countries. Teaching students who have roots in Mexico drew me to these traditions, and to learn more about it. Happening November 1 & 2nd, people will go to cemeteries and honor those who have passed, as well as have family gatherings and decorate with "Catrina" and "Calavera." 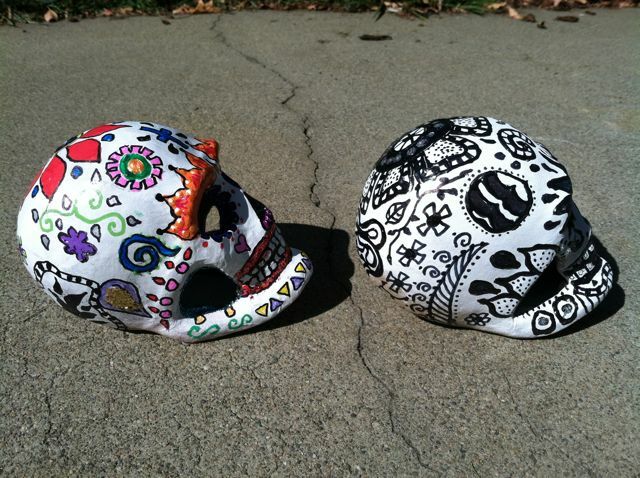 This past week I had a lovely time decorating two Day of the Dead skulls, two different ways -- colorfully, and with just black paint pen and Sharpie markers. 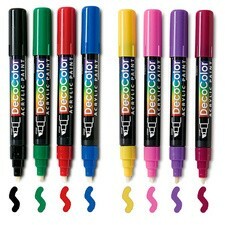 First, I headed to Michael's, coupon in hand, to clean out their supply. You know, these skulls come out in August/September, so it's important to get 'em while they're there! 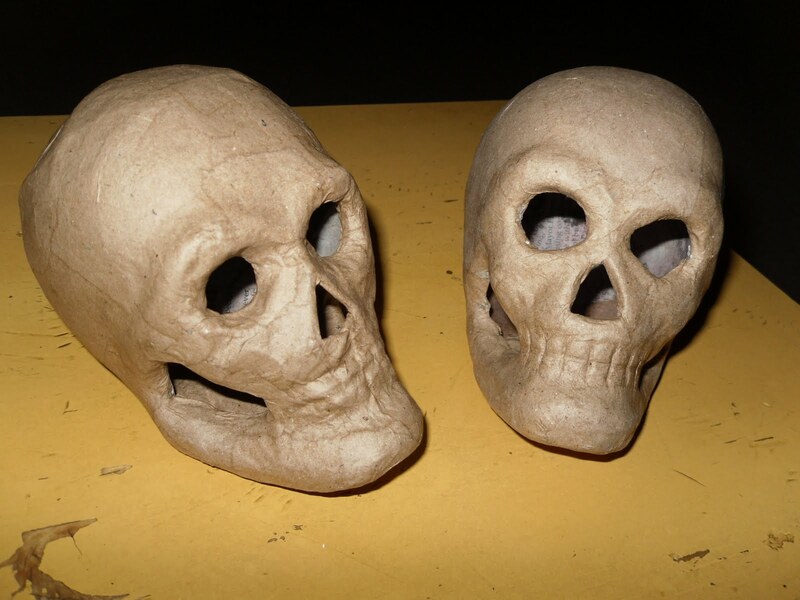 Then, I went to Home Depot and picked up some glossy double coated white spray paint to give the original brown paper mache skull a nice white shiny finish. It also helped the pens flow freely on the piece. 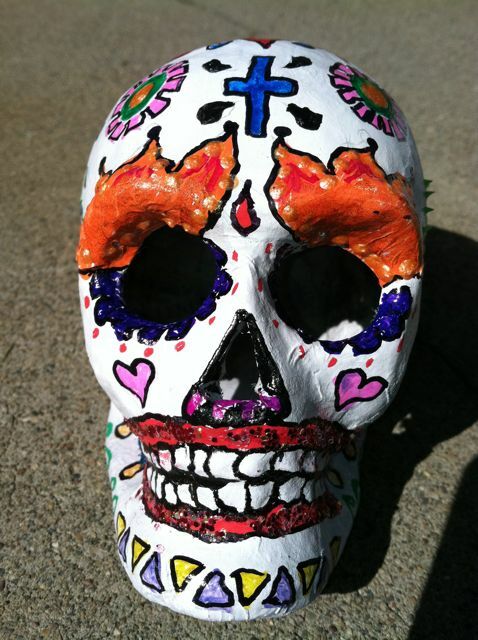 With this skull, I tried to use all my favorite colors and went to town with the elements of traditional Day of the Dead skulls -- flowers, (traditionally, it's Marigolds - for their color & scent to attract the spirits), crosses, swirls, flames etc. Of course, I had to use sparkle -- applied with good ol' Elmers Glue, as well as t-shirt puff paints I found in the garage from an art project long ago. 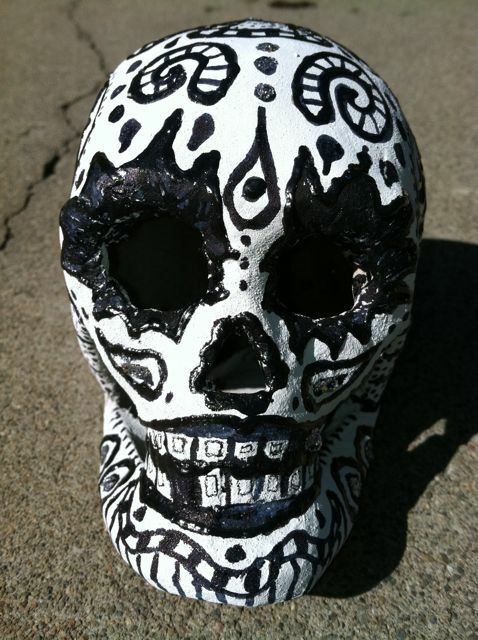 I taught an adult group this skull project, and one of the ladies inspired me with her detailed black and white skull. I tried it myself a couple of days later and love it. I also used silver glitter and black puffy paint to make it pop more. 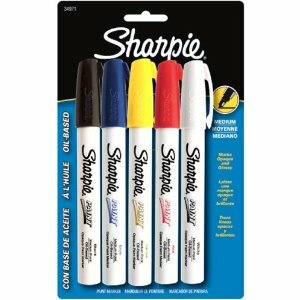 Here are the paint pens that I purchased to supplement my Sharpie markers. (expensive, hence the Michael's coupon!) I loooooved the way they flowed across the surface. I went back and forth between the oil and the acrylic kind, and of course, Sharpies can do no wrong. So much fun! This project's a keeper in my books. My girlfriend thought it might be a fun challenge to purchase a few pounds of bulk vintage jewelry from EBay and see what a few of us could make from it. When I arrived at the meeting, I drew a number, and received the corresponding numbered bag. It was like Christmas all over again! In there were some terribly cheesy wooden teacher necklaces, some 1960's plastic Christmas pins, plastic beads and a mishmash of everything silver, gold and painted, beaded and chained. Wow! I took a deep breath and sorted the pile into what I liked and what I didn't and the silver pieces just stood out and screamed, "Use Me!". 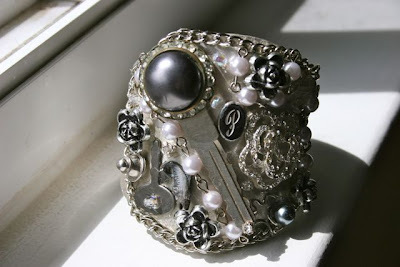 Like a crow, I kept picking at them -- taking a pair of pliers and prying off rhinestones from old necklaces, a fish from an old tie tack, some luggage keys and old buttons. Soon I had amassed enough to cover my $2 cuff from H&M that I had brought along on a whim. 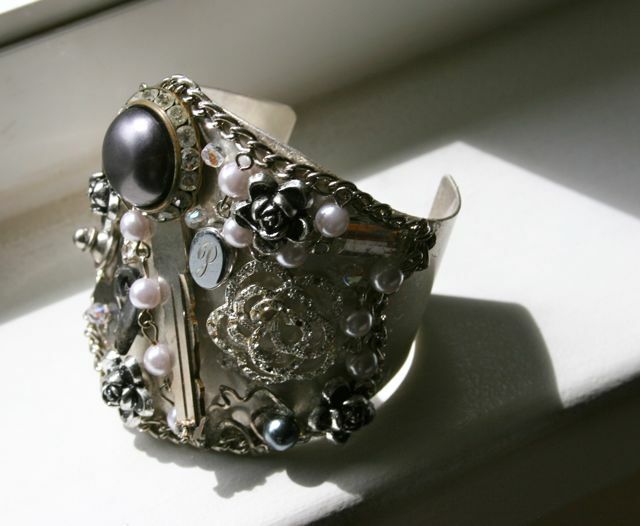 As the room filled with the toxic fumes of my E-6000 glue, I glued away, placing the silver pieces all over the cuff until it looked just right and my head was just this side of getting high. I love the way it glistens and it looks great on-- dare I say a little "steampunkish?" I would never describe myself as a "sparkly" person, but I'm dying to wear it, probably dressed down with my jean jacket next time I head for a night out. Ahh, I love a good challenge. Especially those that stretch my creative juices and make me a little uncomfortable. Last night I joined an artsy "Meet-up" group for a 4th of July Jewelry Jumble Challenge. Everyone was given the same pre-sorted bag of beads ($10) and had two hours to come up with a piece of jewelry they would wear, using the beads provided. I was scared! I brought my jewelry tools, wire, chain and hoped for the best. I was also nervous because I couldn't find my crimp beads to close up a necklace, so it meant having to purchase some from another member....something shy little old me was dreading! The beads were all in 4th of July colors -- red, white and blue. The host had chosen some delicious looking real white free-formed pearls, some Swarovsky teardrop crystals and other pearls and glass beads. 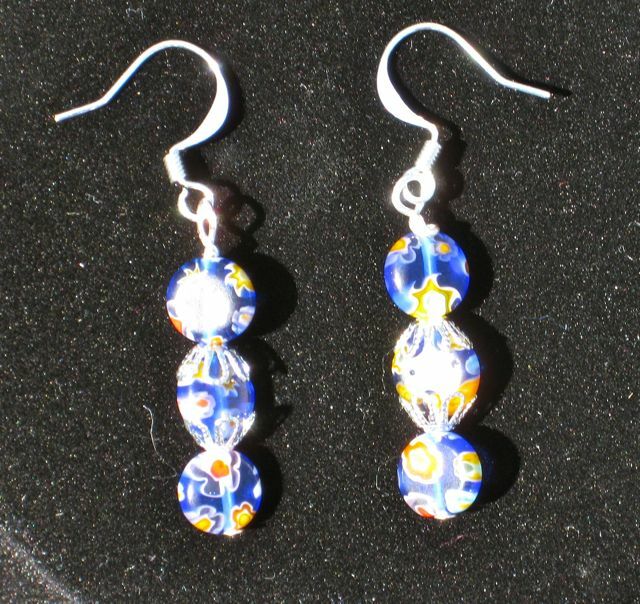 There were also some blue millefiori beads that threw me for a loop because they didn't seem to go with all the other higher end beads. I let the beads speak to me, and those white pearls just begged to be hung by a chain and be featured. I am a big believer of putting the "money" in the middle, so that's where I put my favorite beads, and worked up from there. 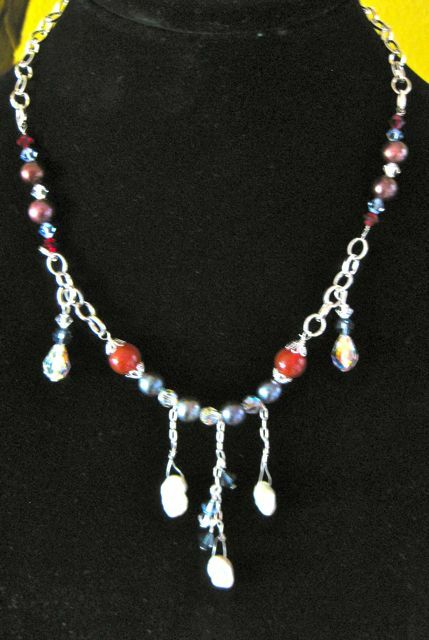 Since I didn't want to ask anyone for crimp beads, I also figured out a way to make the entire necklace out of chain and wire -- it also took care of my personal challenge of not using any of my own beads -- just those provided! Here's my 4th of July necklace, and accompanying earrings. Finished in about 75 minutes, with time to spare to chat and see what everyone else has created! 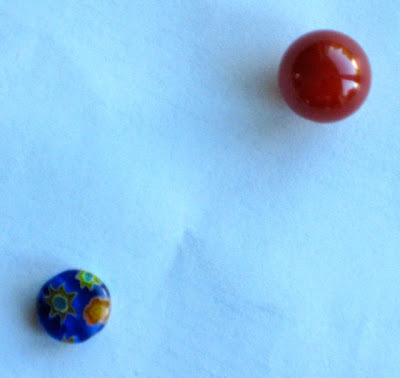 I am also showing you the two beads that refused to co-operate and work with my design. These little orphans will just have to be used elsewhere. I'm pleased. I was certainly challenged, and there was that underlying fear that the necklaces would be judged at the end. Would I have stood a chance if it was? Hard to say! Everyone has a different idea of what is beautiful, and I tend to design for myself, 'cause I'm the one wearing it. Happy 4th of July my fellow creative peeps! If you know me well enough, you know that nail polish is a waste of time for me. My hands are forever caked with paint or clay, my palms regularly in a state of fresh cut or newly scabbed from furiously cutting glass for my fused glass jewelry, and now I can say I've got tiny little prick marks all over my fingers. I wear my messy, wounded hands with pride, as to me, it's a sure sign I've been delightfully creative! 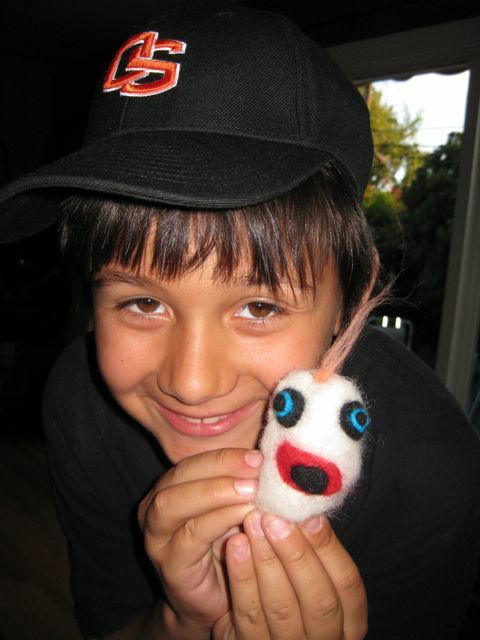 My son and I started our first felting project today. 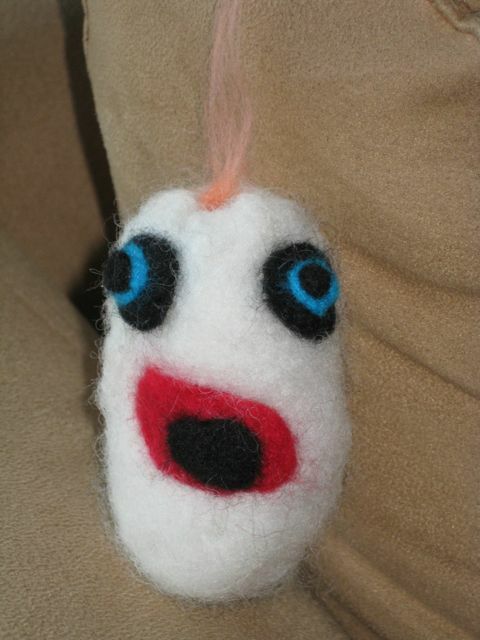 When we were at the Maker's Faire, we were entranced with a booth which had the cutest little egg men made of the colored wool. 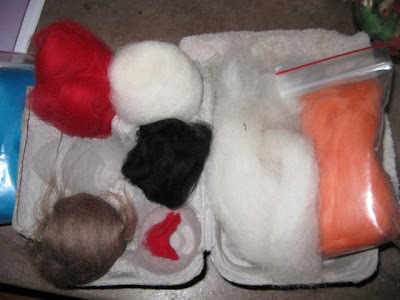 We purchased a kit ($18 for 2 needles, instructions, squishy base, and wool) and eagerly began the process. 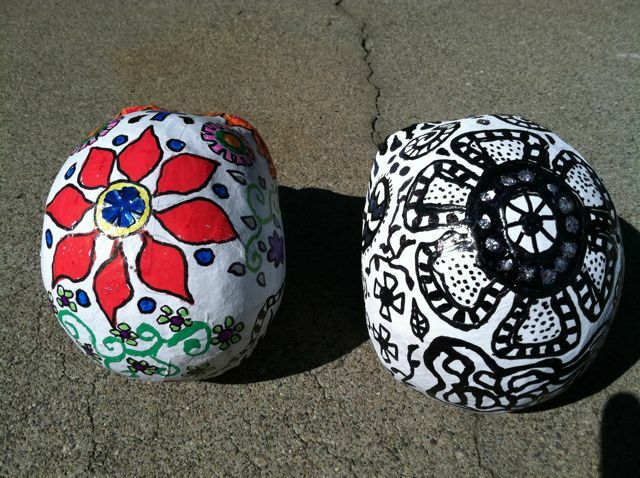 We began with choosing our base color for the egg and rolling it into a loose ball. 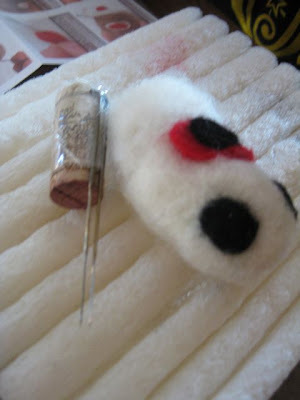 Then, we took the two felting needles that came with the kit and attached them to a wine cork for "double-the-poking." 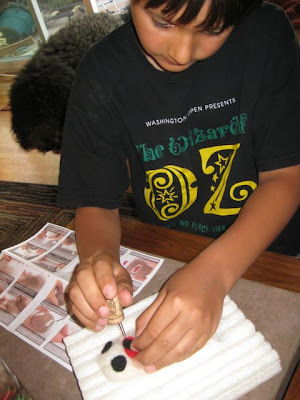 We took turns poking away at the wool while the needles entangled the threads and made the wool denser. We shaped as we went, trying to get a thick oval shape. Not as easy as it sounds, but my standards are low, so we did our best! It was when we started to get the smaller pieces with the eyeballs that things got painful. As we poked away, we started to gain confidence and pick up speed. Next thing you know, we are both bleeding from the fingers and out come the bandaids! The entire egg probably took about 40 minutes or so, broken up into two parts as we took a break from it to heal our chubby digits. LOVE IT! I can't wait to do the next one, and I love the fact I found a cool craft my son enjoys as much as I do! A while ago, I noticed one of my Facebook friends was involved in a "meet-up" group called, "Handmade Enthusiasts." I checked it out online and joined, seeing that the group met nearby, and explored simple arts and crafts on a weekly basis. It seemed like just the kind of thing I may enjoy on those evenings I need a little creative jolt. 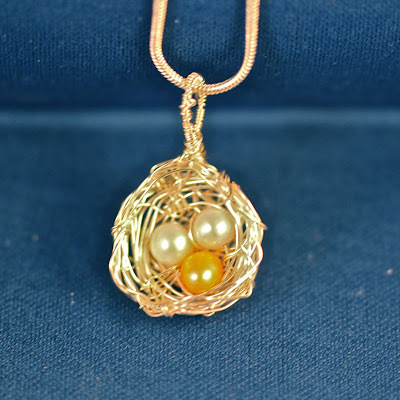 Last night, I met my fellow craft enthusiasts to make this silver wire and pearl bird's nest necklace. How cute is that? There were about 9 women there, chatting about different artistic endeavors they were undertaking, and I loved listening to all the chatter as I bent, wove and crunched 7 feet of silver wire into this delightful little bird's nest. 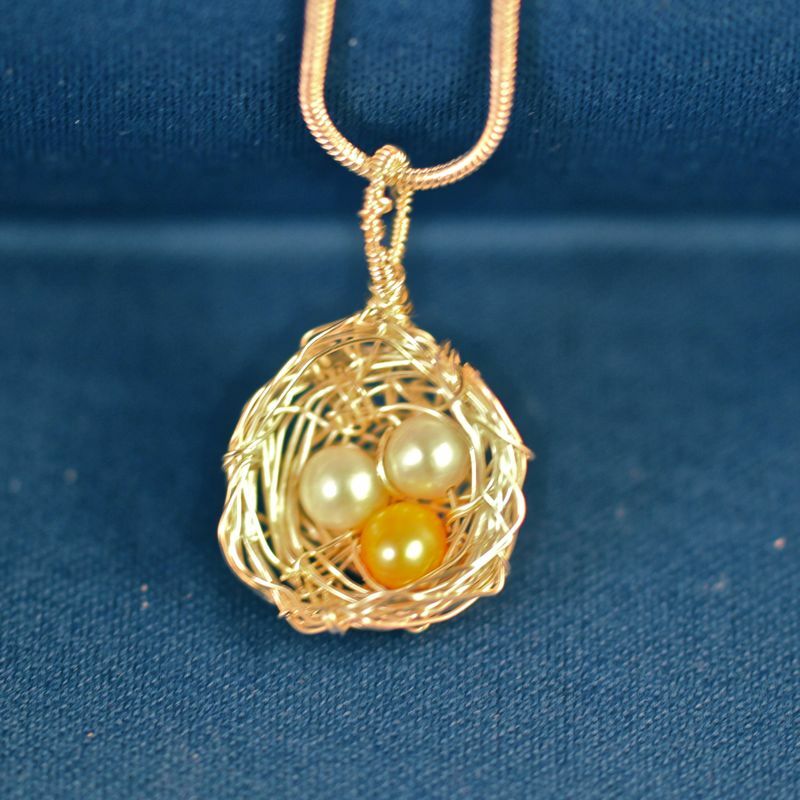 It was interesting to see everyone else's work -- mine was much looser than many of the artist's nest and most of them chose colored pearls with gold wire. I'm a silver girl myself and I'm liking what magic happened that evening. I'd definitely meet with my new "peeps" again. I have an amazing artist friend, Kent, who is like my brotha-from-anotha-motha. Artistically, we seem to always be on the same page. 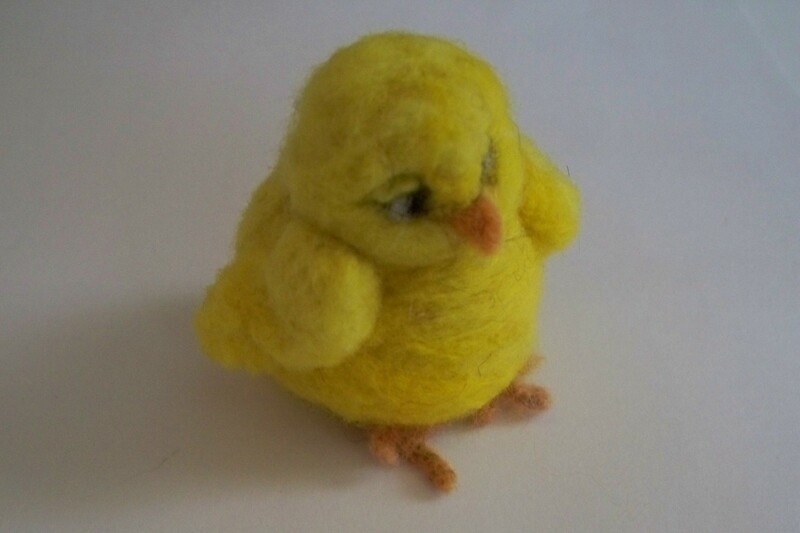 This morning, I was watching a Martha Stewart video on how to felt a small chick out of wool, and when I mention it to him, he goes, "oh, I just did that too." Then, of course, comes an excited exchange of technique and where to buy materials, and what his next project will be. Turns out we belong to the same craft meet-up group, and and are often exploring the same arts and crafts. 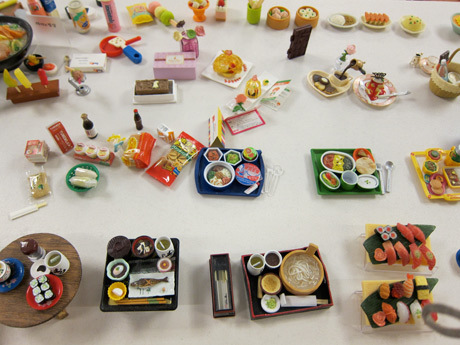 He's been delving into the Japanese mini-fake food craft trend lately, and I look forward to checking that out as well. He's a professional graphic designer, and I love everything he designs, including these cute little doodle cube characters. The characters are sold as pins, stickers and stamps online and at different stores, and I was really inspired at the way he merchandised and promoted his work. Recently, he offered his knowledge of Adobe Illustrator to teach some kids how to do a digital cartoons and make buttons out of their creations. Kent offered this through my school's auction (raising lots of money for the kids), and today, our winning bidders spent the morning learning to cartoon on their computers. Besides whipping up a delicious spaghetti lunch for the kids, I also followed the lesson along with them, learning to do cute characters and making some buttons of my www.artfulcrab.com company logo. I think the boys who learned from Kent came away with really great characters from the program, and Adobe Illustrator software so they could continue cartooning at home. I enjoyed myself too -- always love to learn something new, and appreciated that he shared his love of digital cartooning with us. Nothing like a gorgeous, sunny day to bring you outside after spending the last couple of months keeping warm indoors. The warmest day in weeks came this early March weekend, and Jan and I decided to add some shade-lovin' plants to welcome those who come to our front door. It's an area we've struggled with since moving in 5 years ago. The front corner gets no sun, and plants fail to thrive. We removed a strip of grass along the right side of the walkway and went to the plant nursery for some plants that love the shade. What a great assortment this time! I'm so excited to see how they'll do over the spring and summer. As an artist, my favorite part of gardening is figuring out what plants go where, and what areas to accessorize with rocks, statues and whimsical gnomes! This is our front door area a little over a year ago. You can see what landscaping we've had fun with since then! The Heather behind the Pelican was a difficult decision for me. Bees seem to LOVE this plant, and I really HATE bees! And this is how I rewarded myself after a back-breaking day of gardening and artistic landscaping. A Reed's Ginger brew and chocolate chip cookie. MMMMMM! Back in November, I attended a school fundraiser and was a high bidder for a place at a "Stamps & Sangria" party. Last week, it finally took place, and I had the time of my life drinking Sangria like a fish and stamping like a maniac! Woo hoo! Many thanks to Heather, Kelli, Krissy and Norine for organizing such an original evening. I haven't done a lot of block printing, and I was thrilled at all the different ideas the women had for creating stamps and printing them. We began with a basic "chop" stamp for our inititals, which we would use not only to identify our never-empty wine glasses, but to stamp on the corner of all our artworks. We designed and cut them out of sticky-back foam, and attached it to a wine cork. A few drinks later, and we're onto the REALLY fun stuff! I was given a thick block of condensed foam and some grooved cutters to create another design. This time, I made my crab logo from my new "artful crab" site that I'm working on. It took a little concentration, which I admit was difficult because I was laughing so much. Kudos to Norine for putting a host at the cutting table to supervise the carving of her inebriated guests! Then, we rolled paint on a piece of glass with the brayer (roller) and pressed the stamp into it. I ended up making cards with this design, which I used as thank-you cards to our wonderful hosts. How cute is this goody bag they gave us to put all our arwork in? It also included an assortment of papers and this beautiful hand-crafted tissue paper flower. Fun, fun fun. I learned something, and had the best evening ever at this fundraising event. Creating like Crazy for my New Online Shop, the "Artful Crab"
I love a good challenge. My goal: 2 Valentine's Day themed paintings, 3 heart-beaded necklaces and 15 fused glass pendants and earrings by February 2nd. I'm hoping to debut them in my new online store, the "Artful Crab" late next week! In the meantime, I've been cutting glass like crazy, hoping to get some beautiful pieces from the firing. The store idea has been churning in my head for quite some time now. At first, I was thinking Etsy would be a good place to start putting my things, but then I began to dream what it would be like to be in total control of my artwork and the way it was presented. My husband is helping me put together a website, and we've chosen the webhost and the template, and now we just have to get our content in it! I suspect this weekend will include taking a lot of photos of my artwork for the site. This is the fused glass fresh out of the kiln, after slowing cooking for 9 hours. I'm also craving to do a little beading lately, so we'll see what I can fit into the time I have. I've got some great heart-shaped pendants just screaming to come alive with some cute beads framing it. It's exciting and scary, starting my own shop, but I've got to dive in sometime! Stay tuned for our debut day! The day before, we put 2 empty wine bottles in the kiln to fuse flat. It took the WHOLE day to heat these to get the results we were looking for. Several different ramps of heating went from 10 am to 8pm, and finally we turned off the kiln to cool off before we slept. This morning we hurried to the kiln to see the results and were thrilled to see it worked! We have the power to flatten a wine bottle! Of the two we put in, the clear bottle (a fine cabernet) had a bit of opaque texture going on, but the green bottle of "Two Buck Chuck" worked perfectly. Here are the before and after results of the two. I've given the green bottle a little beautifying with some chain and glass beads. Here's the clear bottle. Not quite good enough to use. Here's the green bottle, fresh from the kiln. It's my son's birthday tomorrow, and I am a terrible mother. I forgot to plan for something special to give his classmates at the end of the school day. This morning, knowing that the teacher does not like the parents to give out cupcakes or candies, he asks what else can he give them...pencils? erasers? granola bar? I am running around trying to get ready to take him to school and it dawns on me...what's cheap, in the house and fun? Rocks. I love rocks. We've got rocks everywhere. 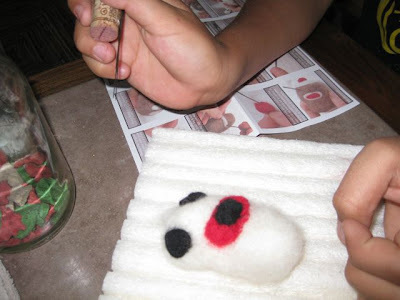 I show him a google image of a pet rock, one of my favorite crafts of the 1970's. He goes for it! Out he runs and quickly chooses 31 perfect rocks from the garden and we quickly wash them before heading out the door at 8:10 a.m. I'm excited. I had scheduled "art time" for myself today, and this may not be of the same calibre of painting a picture or making a fused glass piece, but I'm up for it! I painted each one alien green, drying them off in the oven between coats. Then, with a paint pen, I gave them a few different faces, amazed at how each one seemed to take on a personality of it's own. While all the paint was drying, I found a cute "how to care for your rock" instructional piece, which I included with each rock. This has truly been one of the more fun hours of my week, and I can't wait to see my son's face when he sees all the different creatures he can give to his classmates. I've been working pretty hard on my artwork; some of it I've posted here, and others don't quite make the cut. Until I've got my own web page designed, I thought I'd try selling a couple pieces on Etsy.com -- sort of a trial balloon. It's a great site that will give me a little more exposure while I improve my craft. I feel I still have so much more to learn, and never enough time to really work on things to bring it to the next level. Do you ever feel that way? However, I do have to begin SOMEWHERE, so here it is....putting my work out to the world! Care to join me on my rollercoaster ride? My Etsy store is called, artofbeingcreative, so you can check in there once in a while and see what I've been up to. (I think you just click on "favorites" so that it will come up when you go on Etsy everytime.) I am grateful that so many of my pieces were sold in December, but I hope to have new, wonderful artworks up soon. Wish me luck! It's January, and I've finally finished my Day of the Dead alter, albeit 60 days late. It was supposed to be finished at the beginning of November, when Day of the Dead is celebrated, but life got in the way, and I was not feeling like I had a good grip on how I wanted the alter to look. Over Christmas vacation it finally came to me, and I had a wonderful time in the garage completing the art work. I love all the detail and I used a little glitter on the skull to give it pizazz. I think my favorite part though, is the mirror I glued to the back of the box so that the viewer can reflect on their own mortality. The box is simply an old Ikea organizer drawer that was destined for the trash, and the cross, an old necklace that had not been worn in close to 20 years. 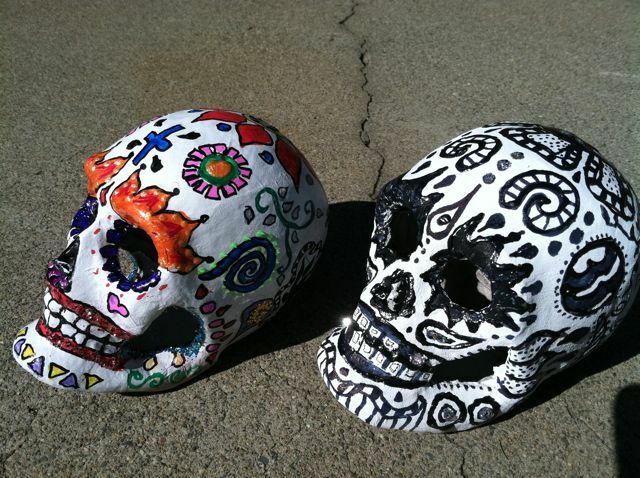 I look forward to seeing it hang with my student's Day of the Dead artworks at the Mountain View City Hall Art Show coming up! 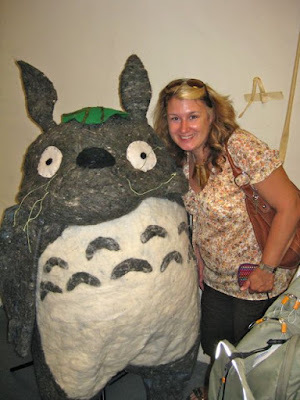 I'm an art teacher who is passionate about sharing arts & crafts with children and adults. I love to fuse glass, create ceramics, bead, paint and play with wire. Over the last 15 years, I've taught art in the school system, teaching kids of all ages and abilities, as well as adults in night school and meet-up groups. It's what I love to do! Check out my site, www.artfulcrab.com, where I sell all the jewelry, paintings etc. that I create! Love, Kath. “You can’t use up creativity. The more you use, the more you have.” — Maya Angelou. Awesome Inc. theme. Powered by Blogger.